I started these Sunday Supper Posts because I had lost my inspiration in the kitchen and wanted to get back to enjoying cooking. However, over the last couple of months, picky esters and busy schedules have once again squelched my culinary enthusiasm. When I sit down to make my weekly menu plan, all I can think of is spaghetti, tacos, BBQ Chicken, and pizza - AGAIN! In fact, this Sunday Supper post was supposed to be published last week but I simply couldn't come up with anything. Instead, I took some time to do what a lot of people do nowadays when we need ideas - I turned to Pinterest. I have several recipe boards and lots of ideas pinned. I thought that, surely, I could fond at least ONE dish to try this week. You know what? I didn't. Instead, I found tons of recipes I have pinned, but will, for one reason or another, never actually make. I thought that I would just share some of them with you and hope that maybe you will find some of the inspiration I am lacking these days! 1. This Cajun Chicken Pasta from Skinnytaste looks delicious, doesn't it?? That's probably why I pinned it pretty impulsively. (Which goes to show the importance of food photography - at which I stink, by the way!) It also seemed like a quick and easy one skillet meal. Upon closer inspection, though, I realized it has three things that nobody but my husband would eat - peppers, mushrooms, and cajun spice. Therefore, I will never actually make it. 2. These Strawberry Cinnamon Rolls from A Few Shortcuts look absolutely scrumptious! However, the recipe involves dry yeast and a rolling pin. I will never have time for that in the morning or energy to prepare it a night ahead. At least not until my kids are grown and there is nobody left here to eat them! 3. When I saw this recipe for Crock Pot Pesto Ranch Chicken Thighs form Picky Palate, I pinned it because it had three elements I love - crock pot preparation, chicken, and ranch. I'm not a huge fan of chicken thighs, but I figured I could substitute boneless, skinless breasts. then, I pictured the looks on the faces of my family members when I served them a plate full of green chicken (more or less) and realized this was another recipe I will never make. 4. I pinned this recipe for Garlicky Baked Shrimp from Normal Cooking because I was intrigued by the idea of baking the shrimp. I know seafood is healthy and I would like to make it more often. However, when I was pregnant with my third child, I developed an aversion to seafood. She's six years old now, but I still haven't really regained my taste for seafood. My kids won't eat it either. 5. I suppose maybe I thought I could use this Tortellini Spinach Bake from Our Best Bites to sneak in something healthy under the disguise of pasta. Then I came to my senses and realized that would never work. Plus, my hubby doesn't like "creamy" pasta sauces. Perhaps, I'll do as it suggests and make it for someone else sometime. 6. I thought this Wagon Wheel Taco Pasta Salad from Cara's Cravings looked like a fun crowd pleaser. Maybe for a pot-luck type of thing?? It's not for my family, though. We have this weird idea that Italian (pasta) and Mexican don't go together and, though the recipe is interesting, nobody here would partake. 7. I love manicotti and so does my vegetarian daughter. That is probably why I pinned this Stuffed Manicotti from Julia's Album. To actually make it, however, would be tedious. It would require time and patience to stuff each pasta tube and those are two things I simply don't have. 9. At first, I thought it would be fun to jazz up the good ol' mac and cheese with this King Ranch Mac and Cheese Recipe from Southern Living. Then, I remembered that mac and cheese is one of the few things that everybody will eat and I decided it was better to not rock the boat. 10. Finally, I will never make this Cheesecake Stuffed Dark Chocolate Cake from My Recipes. "Why?" you ask. It does look heavenly, doesn't it? Layers of dark chocolate cake topped with cream cheese icing, stuffed with cheesecake bites and candy bars, and drizzled with caramel. YUM!!!! And . . . I just gained 10 pounds thinking about it. If I actually made it, it would sit in the refrigerator day after day sweetly calling my name and begging me to eat it up. My family doesn't have much of a sweet tooth, so I would be forced to put the cake out of its misery and, those 10 pounds I gained just thinking about it, would turn into fifteen or twenty! How about you? Did any of these recipes tickle your fancy? Would you ever actually make them? If you would like to see what other recipes I've pinned and may or may not ever make, follow me on Pinterest! I seriously made have a ton of recipes I too have pinned and sadly never tried or will. You are right sometimes a recipe looks good in theory and then for whatever reason just isn't feasible to make for your or your family. This is hilarious and maybe a good idea for a #TuesdayTen? Things we have pinned but will never accomplish? Like..ever? I had a big aversion to chicken with Des but it went away in my second trimester. With Scarlet, it was kale and beets. They both came back eventually but it took a long time.. I am such a compulsive pinner. I am guessing that about half of the recipes I pin I'll never cook, seventy-five percent of the crafts I'll never make, and ninety-nine percent of the outfits I'll never wear! You're right - that would be a good #TuesdayTen! I have never been a huge seafood fan, but after that pregnancy I just have no taste for it at all. Yeah, I should probably clean mine up, too, but then I wouldn't have had this post! I love crock pot meals when they ten out well. I have had my fair share of duds, too, though. Ha! Same here! I don't even bother pinning many crafts, but the recipes and outfits - YES! I pin stuff I know I will never make, too! Here is my manicotti tip - after I boil the manicotti but before I stuff it, I just slit it down the side. Then I can put the filling in, fold the top over and cover it with sauce - no one ever knows the difference and it is super easy!!! I actually made that Skinnytaste Cajun pasta. It took five times longer than expected and no one was impressed. It also cost a pretty penny. Never make Trisha Yearwoods peanut butter butterscotch bars. That was my utter failure this weekend. Too rich and buttery. I would love to come over and share that goat cheese pasta with you! I pin things I'm never going to make too...mostly desserts though. I don't have the patience for baking most of the time. Every once in a while I try something new, but it's not very often. I leave most of the baking to my husband and daughter. Well, glad to know I am not missing anything on the Cajun pasta. I haven't tried any Trisha Yearwood stuff, but I have done some Pioneer Woman recipes. Most of them were pretty good, but lots of calories! I think that pasta sounds delicious! I don't do much baking because I don't have the patience or the time. Plus, I would be the one eating the majority of whatever I made. We all love shrimp, and I just printed out that recipe to try. I'm with you on all the others, though. No one would eat them. Well, Matt would, but he eats anything. Maybe I just need to make that cake and make sure I invite enough people over to help me eat every last crumb! :-) Although, I'm sure it wouldn't tun out as pretty as the picture! Well, I hope the shrimp turn out to be good. My husband would love it and I would be willing to try it, but none of my kids would touch it, so it's just not worth the effort - although, it seems easy enough. Lisa this is awesome, hilarious in the saddest of ways (because it's hilarious only because it's too real and hitting very close to home right now). UGH. Pinterest? So inspiring. Until it's not because nobody in my family would eat green chicken, either and why mess with the perfect mac n cheese??? Oh and the fancy goat cheese girlie lunch? Can I please come if you ever make it because I LOVE goat cheese, too. Ha! I know what you mean...I probably will not make many of the recipes I pinned, especially some of those decadant sugary ones, but somehow by pinning I guess I figure its my way of "virtual tasting". Great post! This is so funny! 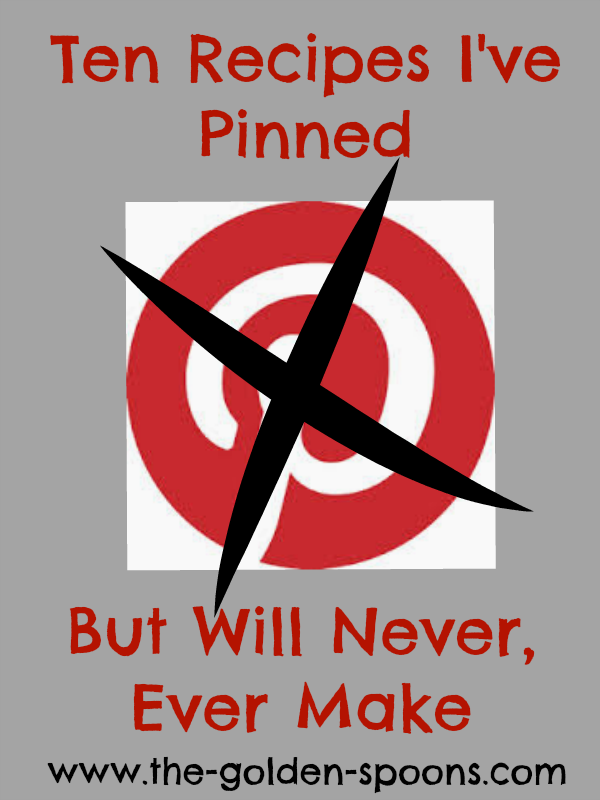 I have so many pinned that I want to try, but that I know others in my family will hate. That's OK though, I'm telling myself that they will still be around 50 years from now when I might be cooking for one. ;) I did a round up post of recipes that I DID make and now love if you want to look for it. Working on another one coming up soon.